This article is about the city in Quebec. For other uses, see Shawinigan (disambiguation). Shawinigan is a city located on the Saint-Maurice River in the Mauricie area in Quebec, Canada. It had a population of 50,060 as of the Canada 2011 Census. Shawinigan is also a territory equivalent to a regional county municipality (TE) and census division (CD) of Quebec, coextensive with the city of Shawinigan. Its geographical code is 36. Shawinigan is the seat of the judicial district of Saint-Maurice. The name Shawinigan has had numerous spellings over time: Chaouinigane, Oshaouinigane, Assaouinigane, Achawénégan, Chawinigame, Shawenigane, Chaouénigane. It may mean "south portage", "portage of beeches", "angular portage", or "summit" or "crest". Before 1958, the city was known as Shawinigan Falls. In 1651, the jesuit priest Buteaux was the first European known to have travelled up the Saint-Maurice River to this river's first set of great falls. Afterwards, missionaries going to the Upper Saint-Maurice would rest here. Before Shawinigan Falls was established, the local economy had been largely based on lumber and agriculture. In the late 1890s, Shawinigan Falls drew the interest of foreign entrepreneurs such as John Joyce and John Edward Aldred of the Shawinigan Water & Power Company (SW&P), and of Hubert Biermans of the Belgo Canadian Pulp & Paper Company because of its particular geographic situation. Its falls had the potential to become a favorable location for the production of hydroelectricity. In 1899, the SW&P commissioned Montreal engineering firm Pringle and Son to design a grid plan for a new industrial town on the banks of the Saint-Maurice River, providing the ground work for what would become Downtown Shawinigan. In 1901, the place was incorporated as the Village Municipality of Shawinigan Falls and gained town (ville) status a year later in 1902. The hydro-electric generating station contributed to rapid economic growth and the town achieved several firsts in Canadian history: first production of aluminum (1901), carborundum (1908), cellophane pellets (1932). Shawinigan Falls also became one of the first Canadian cities with electric street lighting. For decades, the local pulp and paper, chemical and textile industries created thousands of jobs and stimulated city growth (see Sketch Map of Urban Neighborhoods in Shawinigan, 1899-1951). Industrial prosperity fostered the mergence of new districts over the decades that followed the foundation of Shawinigan Falls. Urban development steadily increased in Downtown Shawinigan. By 1921, this sector was densely filled with commercial buildings on Fourth and Fifth street, as well as Station Avenue, one-family residences along the Riverside corridor (current-day St-Maurice Drive) and multi-story tenements elsewhere. The Olmsted Brothers design firm was hired by the city to implement a beautification program. By the late 1920s, Downtown Shawinigan was home to a public market, a fire station, a technical school, several church buildings and two landscaped public parks, including the St. Maurice Park. Many of the opulent uphill homes located in the somewhat secluded areas of Maple Street and Hemlock Avenue were occupied by more affluent people, many of whom happened to belong to the once vibrant English-speaking community, which at times comprised more than 30% of the local population. As industrial plants began operation eastward and northward, neighborhoods were established in Uptown Shawinigan. The emergence of these new districts was defined by and intertwined with the parish structure of the Roman Catholic Church. The Saint-Marc neighborhood, originally known as Village St-Onge, was annexed in 1902, extending the city limits to Dufresne Street. The uptown presence of the Canadian Carborundum and Alcan no. 2 plants favored the foundation the Christ-Roi neighborhood, which was annexed in 1925 extending the city limits to St-Sacrement Boulevard. The land now occupied by the section of town currently known as Shawinigan-Est was annexed in 1932. Uptown Shawinigan had its own fire station by 1922 and its own landscaped public park and swimming pool by 1940. Westside near the Shawinigan River, the existence of the pulp and paper Belgo plant attracted enough residents to form a small, yet stable independent urban community called Baie-de-Shawinigan. Across the St-Maurice River, Shawinigan-Sud (then Almaville) maintained home-rule and developed as a residential hub. Local prosperity was interrupted by the Great Depression in the 1930s. Many plants were forced to temporarily reduce or stop their production, which left many residents jobless. Many families needed public assistance to survive. The City Council enacted a public works program to help families. The promenade along the St Maurice was a make work project during the depression. World War II put Shawinigan Falls, and many others cities in Canada, back on the path of economic recovery. During hostilities, the windows of local power plants were painted black to prevent any possible German aerial attack. The Shawinigan-based 81st Artillery Battery was called to active duty during World War II. Its members were trained in Ontario and the United Kingdom from 1940 to 1944 and contributed to the Allies' effort in the Normandy Landings in 1944-45, which led to the Liberation of France. In 1948, a cenotaph, known as Monument des Braves, was erected in downtown Shawinigan at the intersection of Fourth Street and Promenade du Saint-Maurice (then Riverside Street) near the Saint-Maurice River, in honour of soldiers who died during that conflict as well as World War I. By the early 1950s, the industrial growth in Shawinigan was such that the city offered the steadiest employment and the highest wages in Quebec. Due to this advantageous position, Shawinigan became a hot bed for organized labor and bargaining power. The rise of its working class also favored the presence of numerous independently-owned taverns. As its working class gained economic ground and political leverage, Shawinigan became fertile ground for labor unions. The workers of the Belgo pulp and paper plant went on strike in 1955. In the 1952 provincial election, Shawinigan sent a Liberal member to the legislature. The gesture was largely considered an affront to Premier Maurice Duplessis, who responded by refusing to approve the construction of a new bridge between Shawinigan and Shawinigan-Sud. The new bridge was not built until after the Liberal Party won the 1960 election. It was completed on September 2, 1962. In 1951, the local tavern keepers formed a business association. In 1981, the provincial government enacted a law that gave women access to most taverns. By 1986, women had already been admitted in most taverns. While a handful of local taverns evolved into bistros or restaurants, most of them did not survive the industrial decline that characterized the last third of the 20th Century. In the 1950s, Shawinigan Falls entered a period of decline that would last for several decades. Technological improvements made industries less dependent on Shawinigan's geographic location. Therefore, many employers would relocate to nearby larger cities or close down. In 1958, it received city (cité) status, and its name was abbreviated to just Shawinigan. As a reaction to declining opportunities, many residents, many of whom were English-speakers, left the area. Shawinigan High School is the only remaining English-language school in the city following the closure of St. Patrick's (closed circa 1983). Shawinigan's last English-language newspaper, the Shawinigan Standard, ceased publication at the end of 1970. In 1963, the provincial government of Jean Lesage nationalized eleven privately owned electricity companies, including SW&P. While benefiting the population in general, the decision may have been damaging to local interests. In order to offset the decline of the heavy industry, leaders have promoted the expansion of the local hospitality industry. The most notable example of that initiative is the establishment of La Cité de l'Énergie, a theme park based on local industrial history, with a 115-metre-high (377 ft) observation tower. Since it opened in 1997, it has attracted thousands of visitors to the area. It currently hosts bus tours and cruises, as well as entertainment shows and interactive exhibits. Since 2012, it is also home to the Museum of Prime Minister Jean Chrétien, a venue similar to those operated by the U.S. Presidential library system and which focuses on the gifts received by the former Prime Minister of Canada (1993-2003) during his official duties. The "Trou du Diable" falls, with the Cité de l'Énergie tower in the background. In 1998, Shawinigan merged with the Village Municipality of Baie-de-Shawinigan. Shawinigan has a humid continental climate (Köppen Dfb) with cold and snowy winter coupled with mild to warm summers. Precipitation is moderate to high year round, resulting in heavy winter snowfall, typical of Eastern Canada. The Shawinigan Cataractes of the Quebec Major Junior Hockey League play out of the Centre Gervais Auto in Shawinigan. It is the only team in the league still operating in the same city of its founding. It played host to the 2012 Memorial Cup hockey tournament and won the Championship, defeating the London Knights in the final. The Laurentide Paper Company: AbitibiBowater Inc. the last major paper mill still active in Shawinigan, located in the Grand-Mère district. large hydroelectric complex at Shawinigan Falls: the Shawinigan 2 (1911) and Shawinigan 3 (1948) power plants, established by the Shawinigan Water & Power Company, they have been the property of Hydro-Québec since 1963 and are also located near the Saint-Maurice River. The current church building for Saint-Pierre was constructed between 1908 and 1937. The structure's stained glass was designed by Italian Canadian artist Guido Nincheri between 1930 and 1961. There are eight public schools. Seven of them are under the supervision of the Commission scolaire de l'Énergie school board. Children who meet Charter of the French Language guidelines can attend Shawinigan High School. Its campus is located at 1125, rue des Cèdres and is operated by the Central Québec School Board. Many of the oldest streets of Shawinigan were numbered, like the streets of Manhattan, New York. Similarly, Avenue Broadway was named after the famous Manhattan thoroughfare. Parc Saint-Maurice: located in downtown Shawinigan, it was part of the city's original plan. The Classique internationale de canots de la Mauricie: a prestigious marathon canoe race, held annually since 1934. Grand-Mère's Fête nationale du Québec celebration: consisting of a bonfire and a live performance from local musicians, its audience arguably ranks among the largest crowds in the Mauricie area. It takes place at the Parc de la rivière Grand-Mère. The tradition goes back decades ago. ^ a b c d e f "Shawinigan (Ville)" (in French). Commission de toponymie du Québec. Retrieved 2010-02-11. ^ a b "(Code 2436033) Census Profile". 2011 census. Statistics Canada. 2012. ^ a b Shawinigan (Census agglomeration), Quebec 2011 Census profile. The census agglomeration consists of Shawinigan, Saint-Boniface, Saint-Roch-de-Mékinac. In the 2006 census, the census agglomeration had included Grandes-Piles, but had not included Saint-Roch-de-Mékinac. ^ "Shawinigan Falls Labor Wage Rate Highest in Province". The Shawinigan Standard. D.R. Wilson. 13 October 1954. ^ "Premier Lesage Inaugurated Shawinigan Bridge Sunday". The Shawinigan Standard. D.R. Wilson. 5 September 1962. ^ "Prohibition Repealed at Shawinigan South". The Shawinigan Standard. D.R. Wilson. 5 July 1961. ^ "Tavern Keepers form Local Association". The Shawinigan Standard. D.R. Wilson. 9 May 1951. ^ Wilson, Don (22 December 1970). "Greetings of the Christmas Season: Final Edition". The Shawinigan Standard (27). p. 1. It is with sincere regret and a heavy heart that we must ring down the curtain on the Standard, in its 42nd year of publication and what for the past few months has been the only English medium in the St. Maurice Valley. ^ "Fire Completely Destroys 50-Year Old Vendome Hotel". The Shawinigan Standard. D.R. Wilson. 16 April 1958. ^ Shawinigan includes Baie-de-Shawinigan, which was established in 1907 and merged in 1998. ^ Grand-Mère includes Sainte-Flore, which was established in 1862. 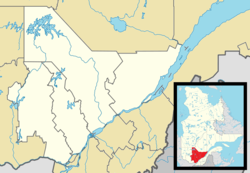 ^ The Catholic parish municipality of Saint-Gérard-des-Laurentides was established in 1922. ^ "Shawinigan, Quebec". Canadian Climate Normals 1971–2000. Environment Canada. Retrieved 17 July 2016. ^ This figure does not include schools located in recently merged entities such as Shawinigan-Sud. For more details, see the article for each former municipality. Wikimedia Commons has media related to Shawinigan, Quebec.